Home › AR/VR/360 › Immersive Storytelling: Using new technologies to make your teaching stick. Immersive Storytelling: Using new technologies to make your teaching stick. Humans have been telling stories for thousands of years, to entertain, inform, teach and inspire. Storytelling isn’t reserved to fiction, stories are used in mathematics, across the sciences, art history, in music and so much more. We remember good stories, they make us feel something, they immerse us in their narrative. Like good stories, our best learning experiences also stick with us. There are similarities, we tell stories using the tools at our disposal so that they stick with the receiver. Similarly when we are teaching, we want our lessons to stick with the students. To do this we utilise the available tools; language (verbal and non-verbal), physical location, technology and pedagogic understanding. I don’t think it would be a stretch to suggest that good teaching can be seen as having similar traits to good stories. They use the tools and techniques available at the time to create a picture of the intended learning and allow the student to make new connections and be inspired or excited by what they are learning. As such I think it is fair to say, the more immersive an experience of teaching is, the more it sticks with us and helps to learn something new. We have seen through the ages that technology has always been there to help tell stories. Of course at the very beginning we only had the spoken word. As the technology of our ancestors developed we saw cave drawings and in recent history we’ve seen stories told through the first still images, through recorded audio and motion pictures. The evolution of technology brings with it more ways to tell stories and virtual reality and 360º cameras are no different, if anything they are able to take immersion in learning and storytelling to a whole new level. Filmmakers, documentary makers, scientists, musicians and more have all found value in being able to tell their stories in this fantastic new medium. With a step change in immersion comes a unique opportunity not only for building empathy but also for giving unique perspectives into areas that are physically inaccessible. Until recently the equipment required to view, let alone produce, high quality immersive content made it largely inaccessible to many. However with a recent influx of mid-priced, high quality 360º cameras and some high resolution stand alone headsets (that do not require a computer), we see a much lower barrier to entry. 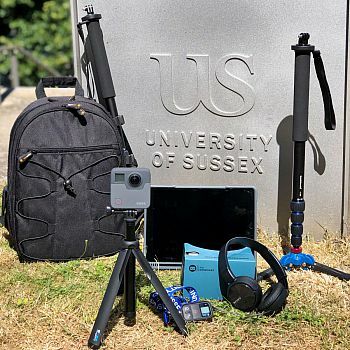 In a recent new initiative between Professor Rorden Wilkinson ( Pro Vice-Chancellor for Education and Innovation) and Technology Enhanced Learning (TEL), we have created a fantastic opportunity exclusively for staff and students at the University of Sussex by creating GoBags. Each GoBag has a GoPro Fusion, a high quality 360º camera that is easy to use and extremely versatile. To preview content we have also included an iPad Pro. Also in the bag are a remote control and tripod for the camera. In addition to being able to create your own 360º content, there is a mobile phone and a Google Cardboard for you to view existing content. TEL are on hand to support you as much as you need, equally we can be fully hands off if you’re happy to explore on your own. GoBags are now available to borrow for free, for you to create your own immersive experiences, to tell your story in 360º. We already have some great examples of how they are being used. These bags are designed to be mobile, easy to use and available to staff and students. We invite you to get in touch and start telling your stories with immersive technology. We can’t wait to see what you create. To borrow a GoBag or for more information email the TEL team at tel@sussex.ac.uk. ‹ Are electronic examinations the future?